It’s years since I’ve made a Wiener Schnitzel. They’re delicious and are so easy to make, I really don’t know why I don’t do them more often – I’ve been looking forward to cooking this recipe ever since starting on this challenge. 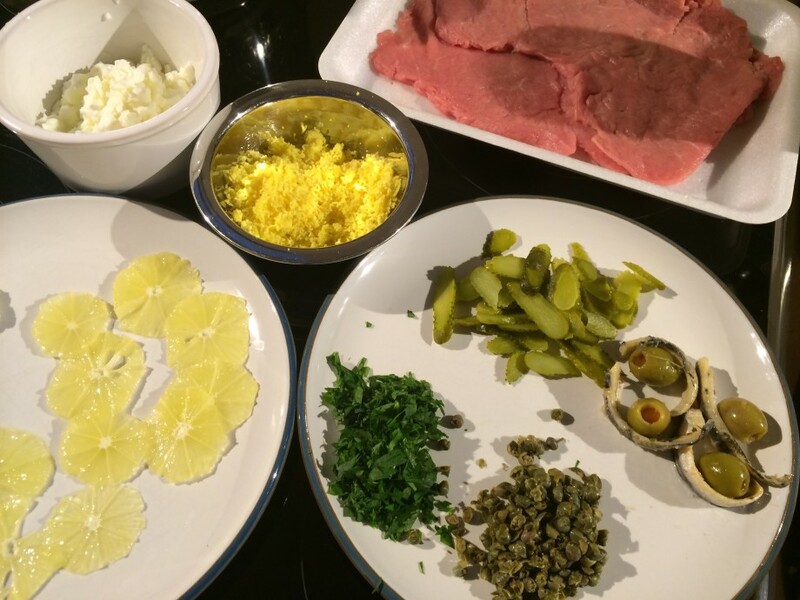 So, two veal escalopes were duly ordered from Ocado, together with a variety of things to garnish them with. The Prawn Cocktail Years is very particular about the garnishes for Wiener Schnitzel, so I started by getting those ready. First, a small lemon, with all skin and pith cut away, sliced thinly. Next, a hard boiled egg, yolk and white separated, the white finely chopped and the yolk pushed through a sieve. Four pimiento-stuffed green olives, each wrapped with an anchovy. A tablespoon of capers, chopped. Four gherkins, sliced. Some parsley, chopped. Well, they were mostly straightforward. Sieving the egg yolk was a bit fiddly, but resulted some rather nice-looking yellow powdery beads. “Gherkins” seemed a bit vague, as they come in all sorts of sizes. In the end I settled on some small cornichons, which sliced nicely. The most problematic item was the anchovy-wrapped olive. Now, let’s be clear here: I hate olives. I detest them. They are vile, foul-tasting things and I don’t understand how anyone can eat them. So, it was with a degree of reluctance that I included them here at all. I resolved to eat at least one, and surely wrapping it in an anchovy (which I love) would help overcome the oliveness of the whole thing.The only problem was that the marinated anchovy fillets I was using were a little on the stiff side, and so wouldn’t stay wrapped neatly around the olives. I gave up, they were just going to have to sit next to each other on the plate. Now for the schnitzels. 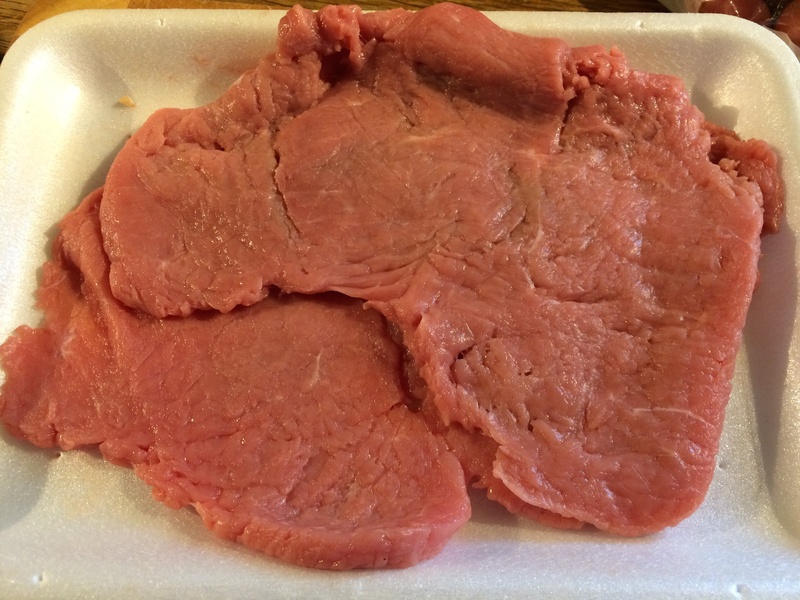 I unpacked the two veal escalopes. Ocado had kindly sent me one small one and one enormous one. I thought about trimming one down so I had two matching ones, but I decided to cook them as they were and share them out more evenly when I served. The fun part of making schnitzels is, of course, beating them into thin slices. I placed the escalopes between two sheets of baking parchment and spent a good couple of minutes beating merry hell out of them. Very satisfying. 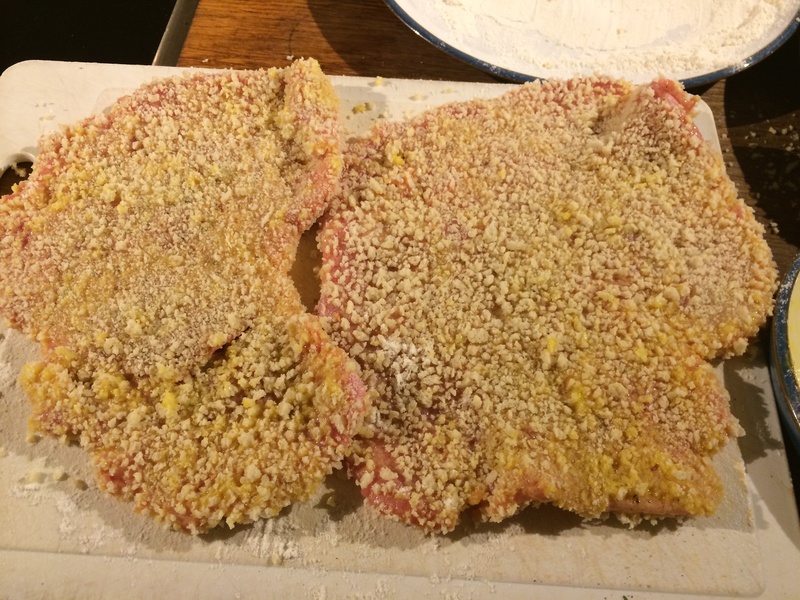 To cook, the veal was seasoned with a little salt and pepper, dipped in flour, then in beaten egg, and finally in breadcrumbs. They were then fried in a mixture of olive oil and butter, and then placed on a plate, surrounded by the various garnishes. I served them with buttered new potatoes, as recommended. The schnitzel was delicious, as were the various garnishes. Except the olives. The olives were foul. 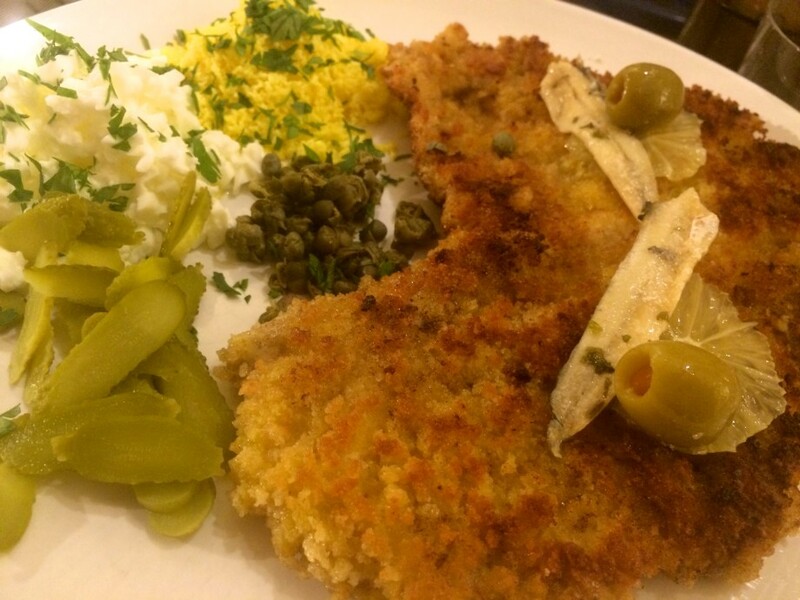 Wiener Schnitzel – I have had this once before, but a long time ago so I couldn’t really remember what it was like. The soft looking pink meat looked good raw. By the time Dave served it, it looked a picture, with delicate lemon slices, stuffed olives and anchovy fillets on it and the beautifully prepared and separated piles of egg yolk and chopped whites dressed with parsley. 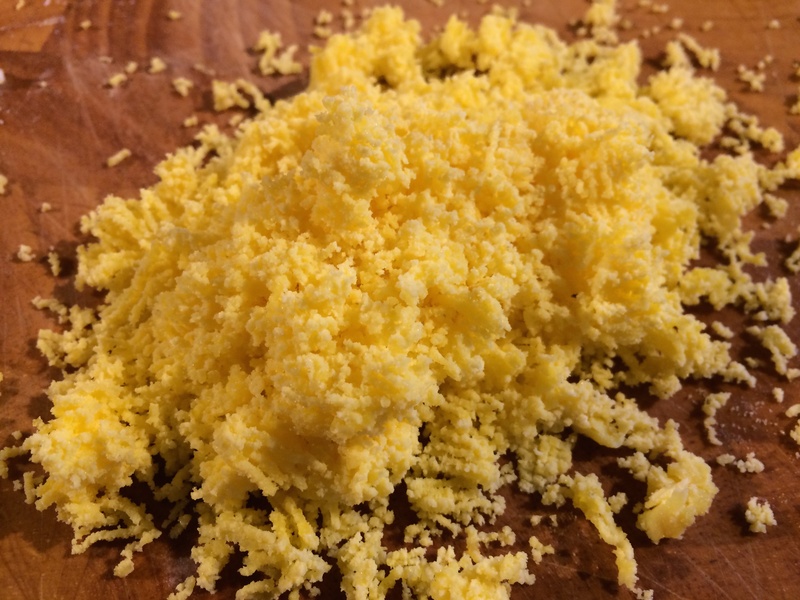 The egg yolk was so finely crumbled that it looked like tiny grains. Turns out he sieved it! Dave sieved cooked egg yolk just so it looked good! The buttery breadcrumb coated meat was delicately flavoured and soft. It was really good and went well with the capers and sliced pickle. BUT I didn’t like the anchovy. I normally like them, but these were posh, posh fillets and to me they just tasted like raw fish and I don’t like that. So I ate one and Dave forced himself to eat one olive and then we swapped the second of each. I’m not sure I would choose this dish in a restaurant, but I think it made a very nice evening home cooked meal. Somehow it felt like home cooking not restaurant food. Would definitely have this again. They really didn’t take all that long to prepare – just a bit of chopping. The egg is the fiddliest, but (excluding the boiling) even that only took a couple of minutes. Any chance you could post the full recipe? Sorry, but I said at the start of this challenge that I wouldn’t post full recipes – as I’m cooking my way through the entire book, it doesn’t seem right to post all the detailed recipes too. I think if people want the full recipes, they really should buy the book. It’s a great book – it really is worth it. Having said that, the Wiener Schnitzel is a pretty straightforward thing to make – you should be able to figure it all out just by looking at the photos. Thanks very much. I am doing them as part of an Austrian buffet for a Eurovision party. I may lose the will to do all those garnishes, but I will do my best.